Thursday night, we lost another commercial fishing boat. It just couldn't make it over the Tillamook bar. But thanks to a heroic Coast Guard rescue swimmer, only one of the four people aboard was lost. "Only" is relative, however, and we grieve for the loss. 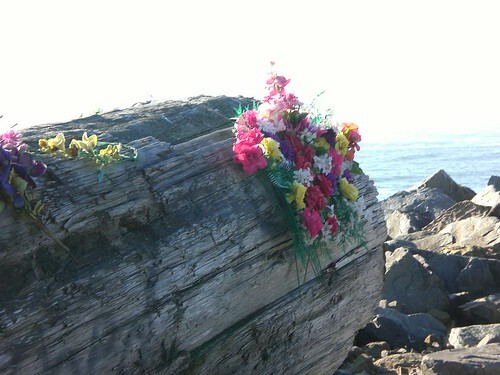 When I arrived at the Barview Jetty the next day, this flower memorial was all that was left to tell the tale. I'm reading: Lost Fishing Boat Memorial (Photo)Tweet this!